On the MetaTrader 4 Trading Platform there is a possibility of algorithmic trading and technical analysis with the help of integrated program language MQL4. 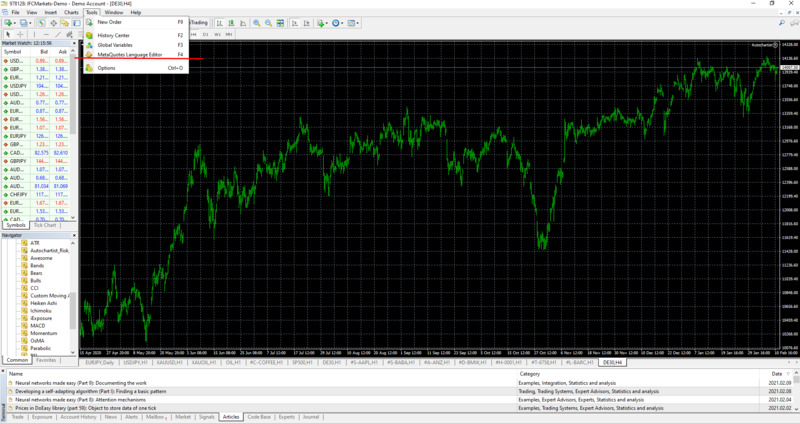 Users create Advisors (automatically trading robots) and their own indicators, immediately activated from MT4 editor-MetaEditor. In this editor all the necessary actions are performed to create advisors, including debugging, testing, optimization and program compilation. In order to launch the advisor on the selected financial instrument it is necessary to connect it to the chart of this instrument. For the connection to the chart on the terminal MT4 an advisor is chosen from the context menu "Navigator - Advisors" and is dragged with the mouse into the desired chart, or with the double click on the advisor it is tied to the active chart. In the process of connecting the advisor in the dialog tab of advisor settings all the necessary settings are specified. If the user wants to use Advisors through MQL4 language on NetTradeX platform, the advisor can easily be converted to NTL+ language. The user can see the conversion details here. All the educational materials on the language MQL4, as well as on the service of trading signals can be found on the site of user community of this language.